This morning I was able to free up some time to go out for a nice /P activity. I have not been able to visit all the newer parks (added this year), so I chose one of those - PAFF-0098. It took me about 1.5h to get there. I had studied the area via Google Maps and found an operating spot quickly. An old broken down gate was useful as a support for my pole. It was cold and foggy with a rather strong wind. 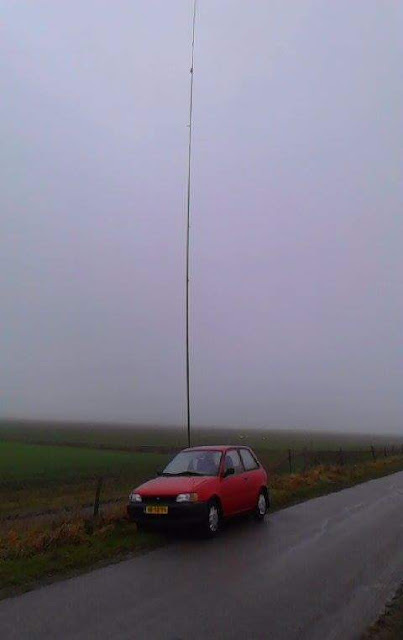 The antenna withstood the elements and performed as it should. I started on 40m using a 20m long end fed mostly vertical with the end sloping off the pole (still using the 18m pole, a longer one is in backorder). The band was quite OK. Signals overall not extraordinary but good copies. QRM was light at my location. I greeted 106 chasers in the first hour. I then went on to 80m for some short skip contacts and 20 minutes later to 20m. 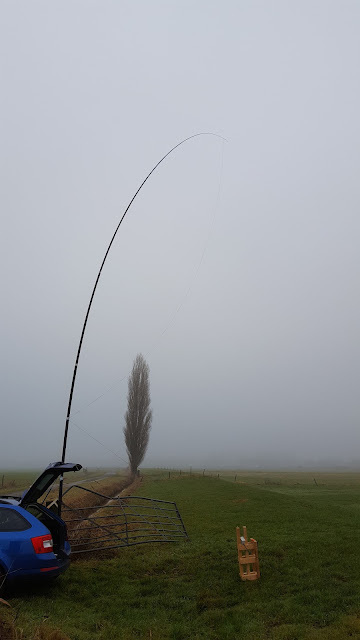 I decided to keep the 40m antenna up and tune it slightly. This saved me some time. In the next half hour I logged almost 40 chasers with average signals and some QSB. The big surprise was VK2ZH. Signals were not strong both ways but I really had not expected to work VK on this mediocre band. I stayed on the band for the last 45 minutes of my activity. With another nice surprise when Paul VK5PAS called me. Again signals were weak both ways but it had been more than 3 years that I last spoke to Paul on the air. Just before going QRT the band opened towards NA with WWFF veterans VO1SA and W1OW calling in. All in all I was on the air for about 3 hours on 4 different bands. I logged 231 calls from 35 dxcc. Strange conditions as I would classify the band as weaker than 2 weeks ago looking at the signals overall but then I did log 2 VKs this time.. go figure.